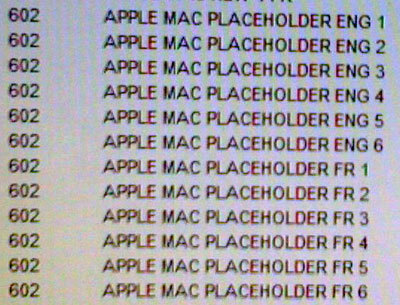 According to an anonymous report, six new Mac placeholder SKUs have appeared in Future Shop's inventory system. While we've been unable to independently verify this at this time, the placement of early "placeholder" part numbers is consistent with inventory practices of some major retailers. In February, we saw MacBook Pro part numbers in Best Buy's systems about 3 weeks before the release of the new MacBook Pros. Future Shop is a Canadian subsidiary of Best Buy. Apple has been rumored to be planning new releases for their laptops (and maybe iMacs) before the holidays. The last rumored date pinpointed October 14th for the launch. Update: According to one BestBuy poster, these SKUs were set up without any knowledge from Apple with only the circulating expectations that Apple would be releasing notebooks in the near future. As a result, there can be no conclusions drawn from this inventory change, except what we already know, that Apple is expected to release new notebooks in the near future. I helped set these skus up. They were set up with no information or assistance from Apple. These were set up as the same time as a long list of placeholders for iPods for the "Let's Rock" event - we weren't sure if there were computers coming at the same time (as you can see in the thread in the Future Shop forums). * We setup a bunch of skus. * We did so without input from Apple. * We did it to be prepared for when new product launches because we find out at exactly the same time you do. Sometimes we get a "you'll see X number of new laptops" but that's the extent of it. * We also did it because we wanted to make sure that we weren't setting skus up in the same time frame that they were going to launch because inevitably someone with a camera phone is going to see them in the system and be a little overzealous and fire off a cropped, poorly compressed photo of our inventory system to engadget/gizmodo/macrumors/appleinsider and we figured if we set them up in advance we can avoid tipping Apple's hand in the future. Yes, we're that considerate of our partners. Phew. Alright. Hope that clears it up for everyone.